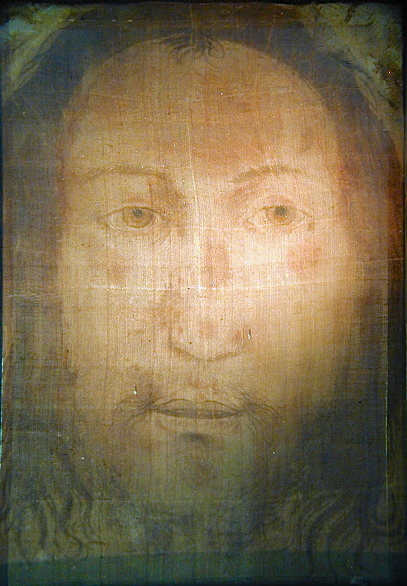 There are at least four separate historical accounts of a veil or cloth of miraculous origin, “not made by human hands,” bearing an image of the Face of Jesus Christ. 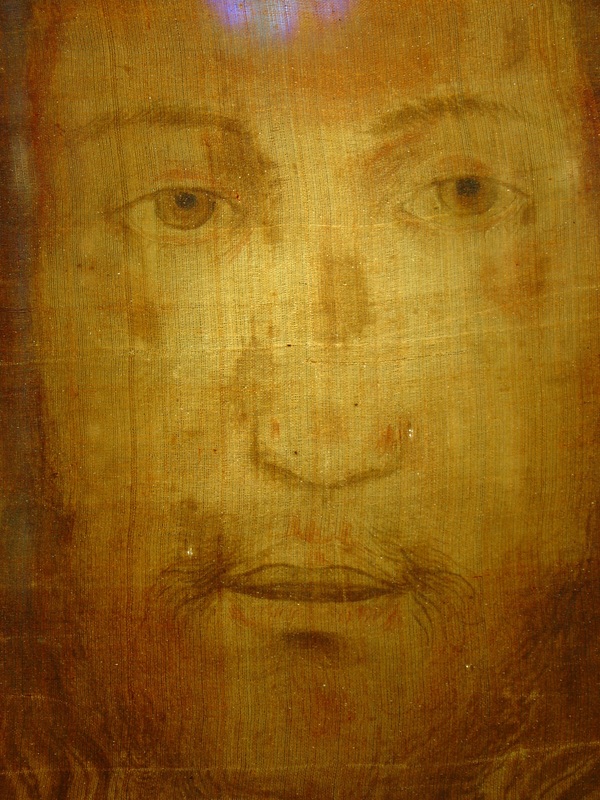 Each account relates, in its own way, that the Sacred Image came into contact with the living Face of Jesus. Human nature, being what it is, has altered the story, over the centuries, like the old game of “telephone” where one child whispers a story to the first child in line and by the time it has reached the last child the narrative has become very different. 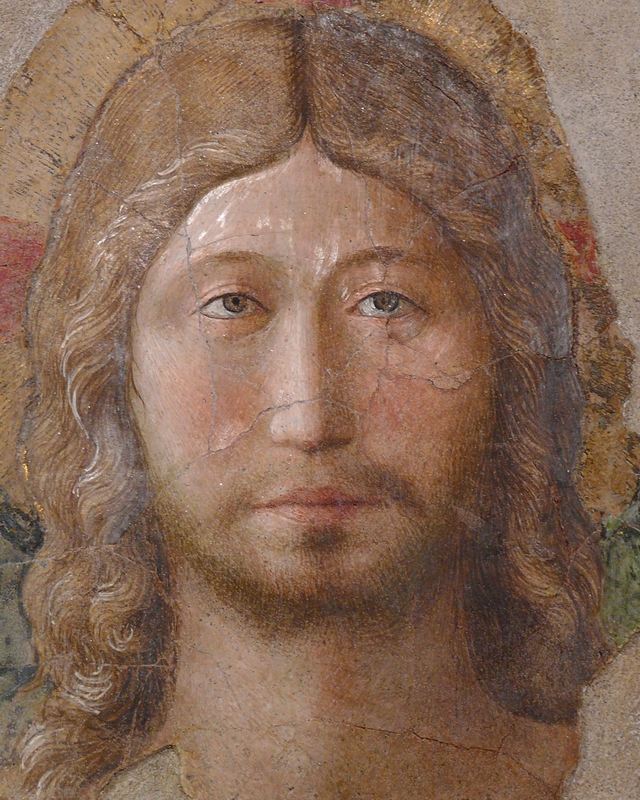 Humanity has journeyed through millennia of dangers, persecution, wars, and intrigue since Christ walked on the earth (and on water), which obscured the facts of the origin of the Holy Veil of the Face of Jesus. The stories of the Veil were handed down to us today by way of history, tradition, literature, art, and music. Somewhere within these intertwined stories is the truth, but, one must have the humility to acknowledge before such a great mystery that we don’t know the whole of the story because God, whose “ways are not our ways,” has allowed them to be hidden. 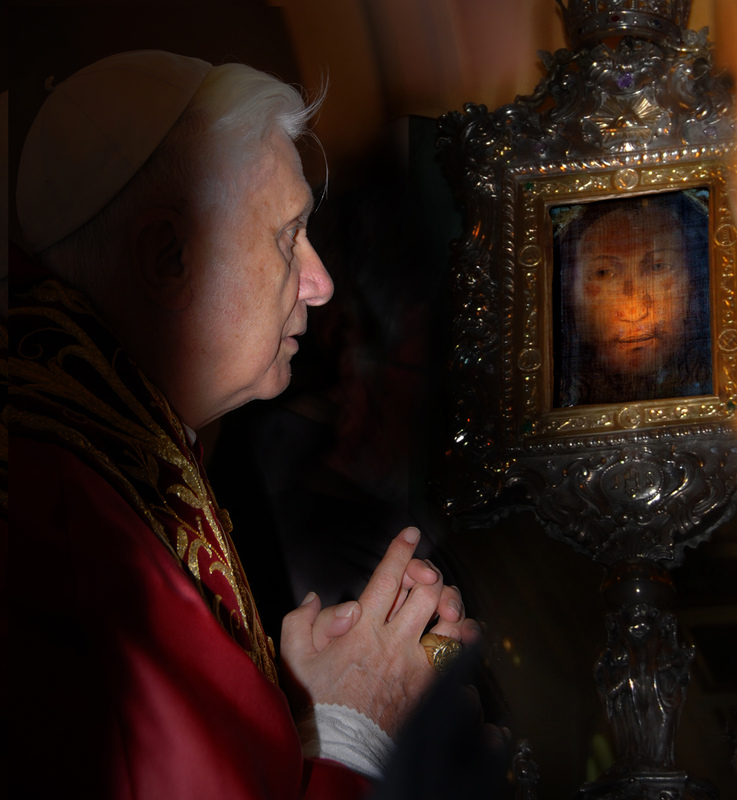 There are many clues (read anything written about the Holy Face by Pope St. John Paul II, Pope Emeritus Benedict XVI or Pope Francis to find those clues) as to why the Holy Face is taking such a prominent role at this particular point in history to draw humanity back out of the abyss of darkness it now finds itself submerged in. It seems that God, in His Mercy, is “drawing back the veil,” in these dark days, allowing facts to come to light. The four stories point us to one image in particular. 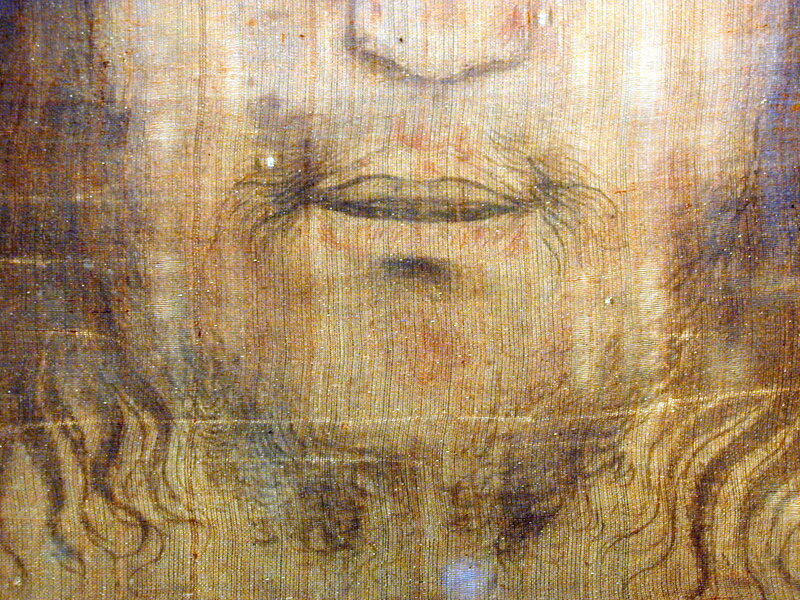 To begin, each are said to depict the Face of the living Christ on a sheer veil or cloth–a human face of a man who has suffered, with traces of wounds, bruises, and swelling visible, especially on the left cheek. His wavy hair is long and parted with a small, short lock of curls at the center. His beard is sparse as though torn, and divided in two. 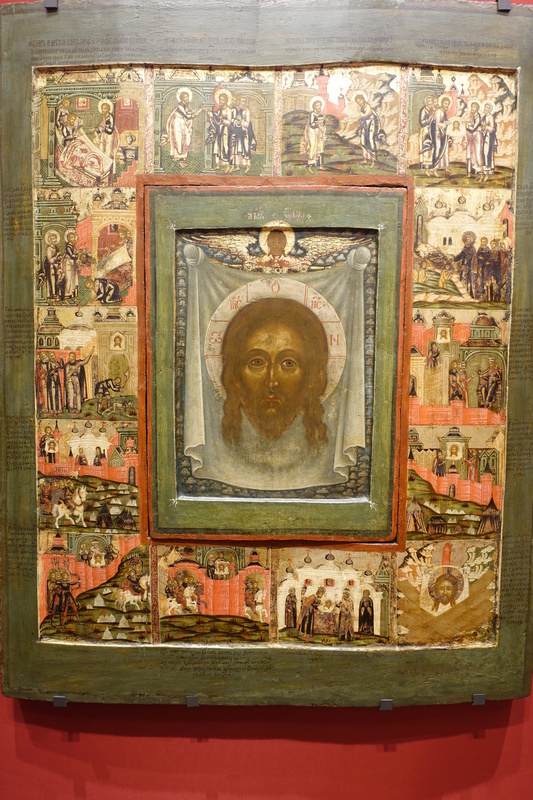 Iconoclasm–the name means “image breaking”; it is a heresy which maintained that the veneration of religious images was unlawful. 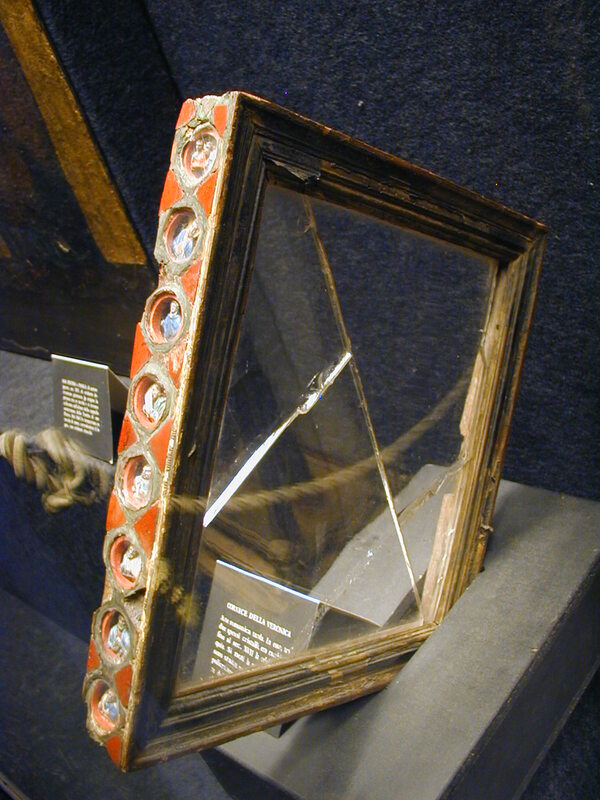 It has been disputed as to whether it began due to Muslim influence, which regarded all representation of the human form to be an abominable idol, or, as some historians believe, whether it came about for political reasons. 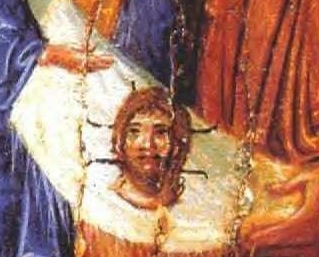 A resurgence of iconoclasm among radical Muslims is in fact prevalent today, as evidenced by statues and holy images that have been destroyed in churches across the face of the globe. 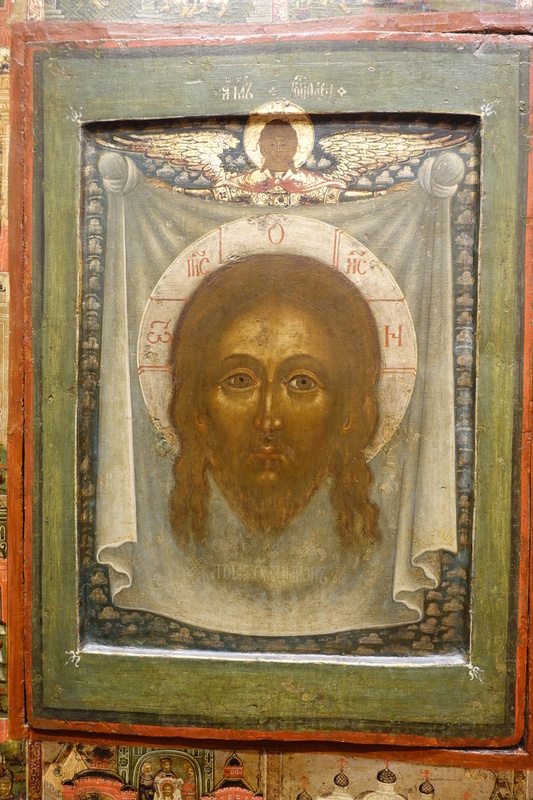 However, there are also some Christians, even today, who believe that venerating images is idolatry. 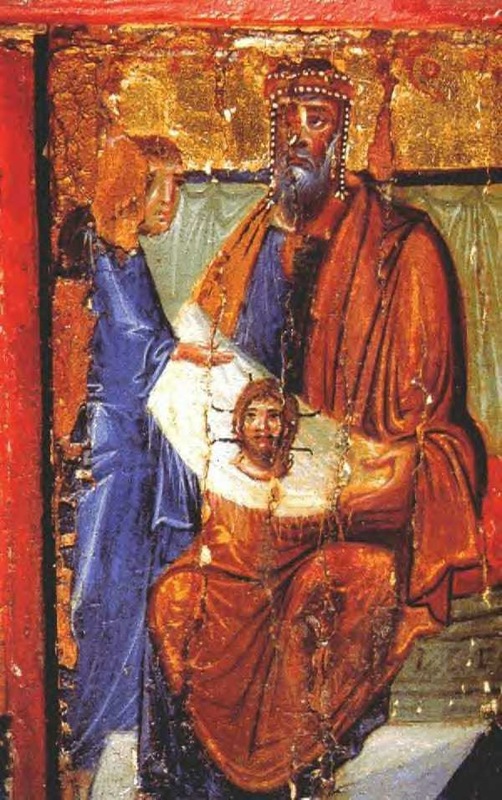 Iconoclasm was condemned as unfaithful to Christian tradition at the Second Council of Nicaea in 787. 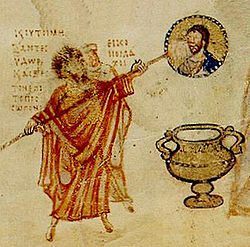 The iconoclast persecution was raging in the 8th century, and though iconoclasts destroyed images and tore evidence of the Holy Face of Camulia from holy books, there were also Early Church Fathers, who opposed iconosclasm like St. John Damascene, a Doctor of the Church who wrote many works strongly defending the use of such images. 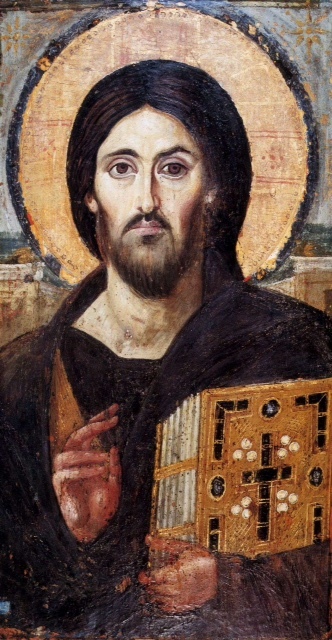 According to one tradition (there are several), the poor King suffered from leprosy and gout and hearing of the miracles of Jesus, sent a letter to Jesus with his secretary Ananias, (who also happened to be the wonderful painter mentioned above). 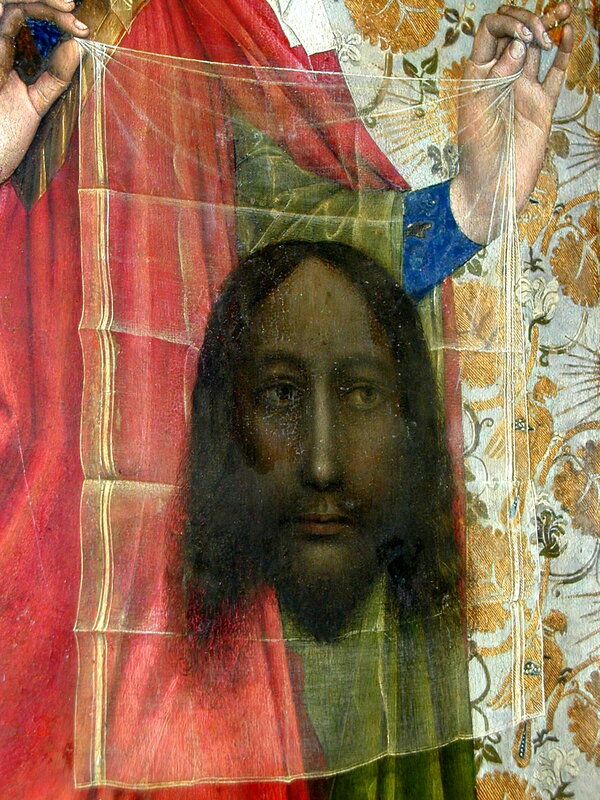 It was St. Jude Thaddeus who brought the Holy Veil to the King. 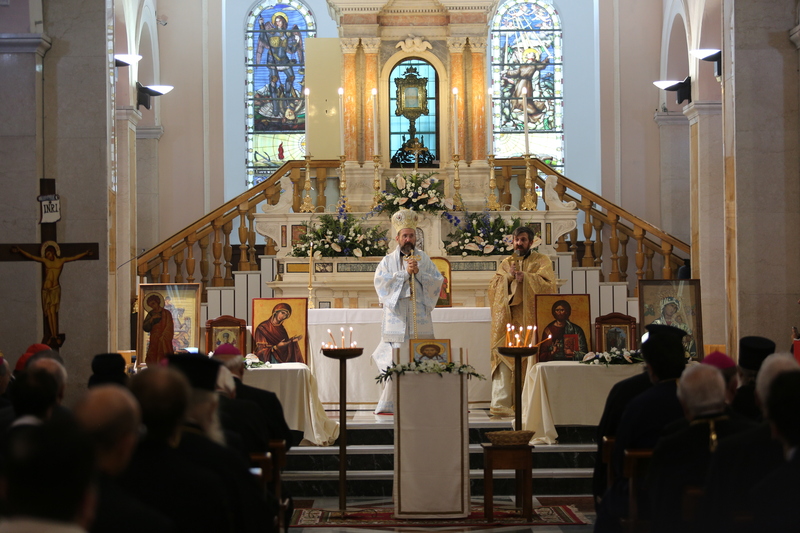 After hearing St. Jude Thaddeus preach, and receiving the holy image the King was healed. 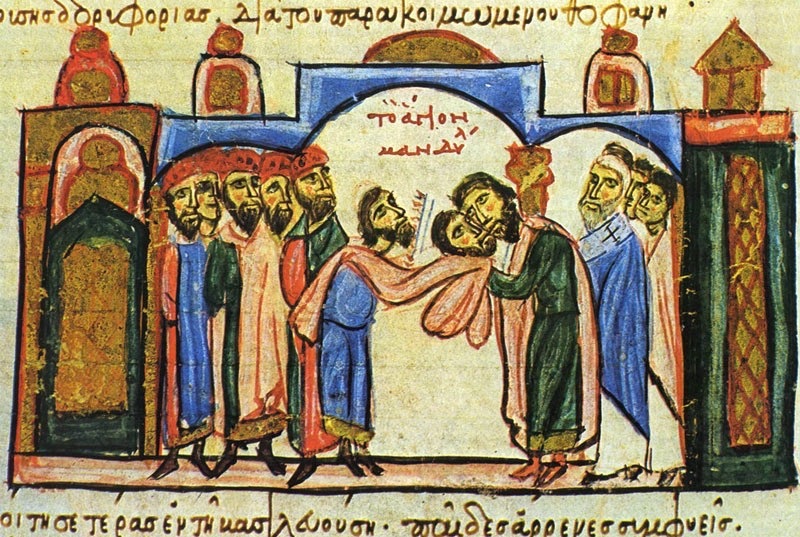 King Abgarus, who brought Christianity to his kingdom, is venerated as a saint in the Eastern Church. 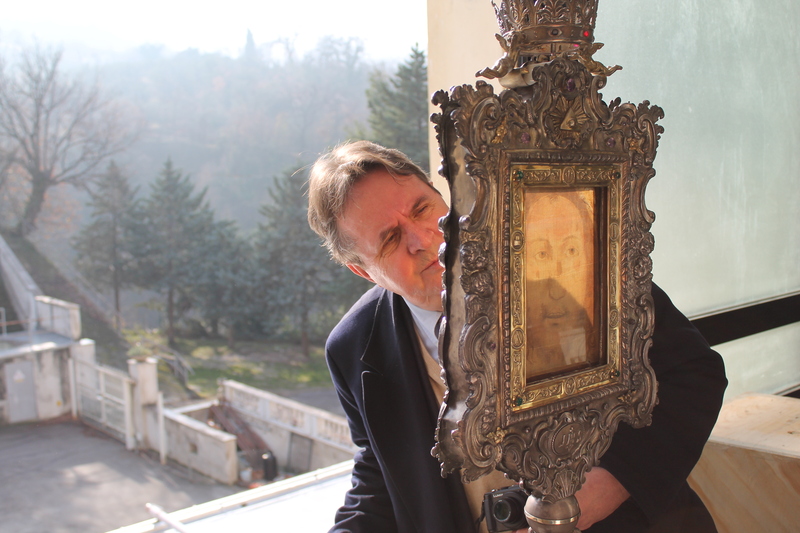 Reference to the Holy Face of Edessa has been found in historical sources dated back to 590. 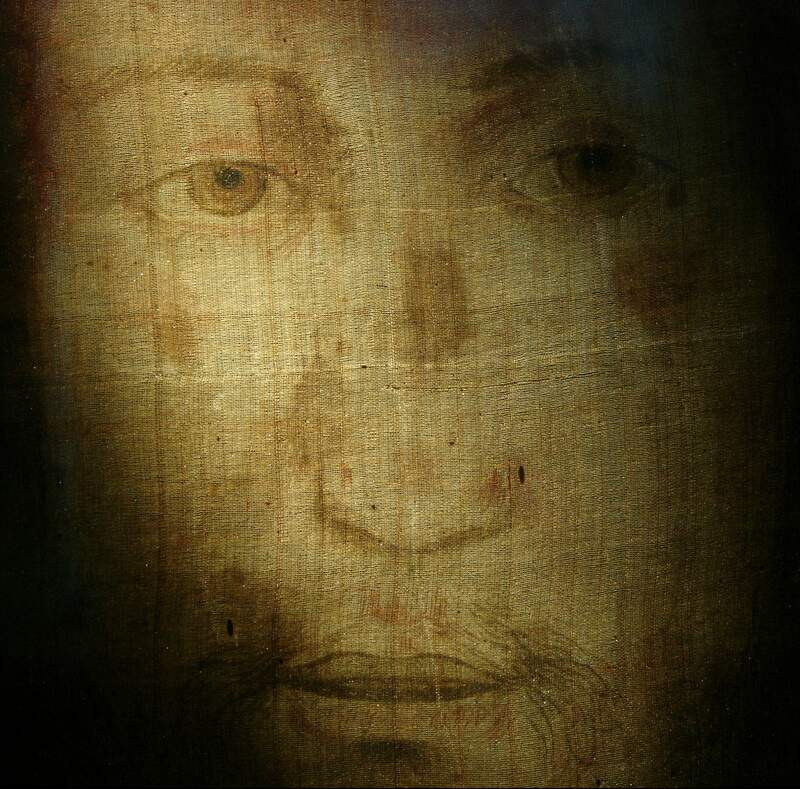 “Arab sources also mention the cloth on which Jesus imprinted the image of His Face.” (source) Although there was disagreement over the centuries as to the question of how the image of the living face of Jesus was formed on the cloth, everyone agreed that it was indeed miraculous. 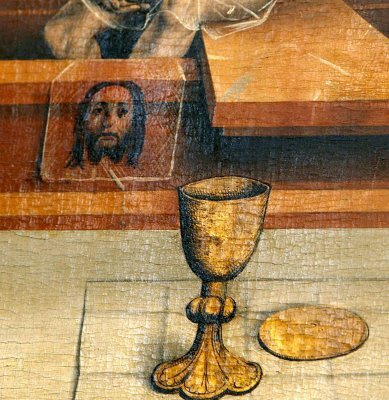 Many reproductions were made of the image, some appearing miraculously on tile that had covered the sacred cloth. 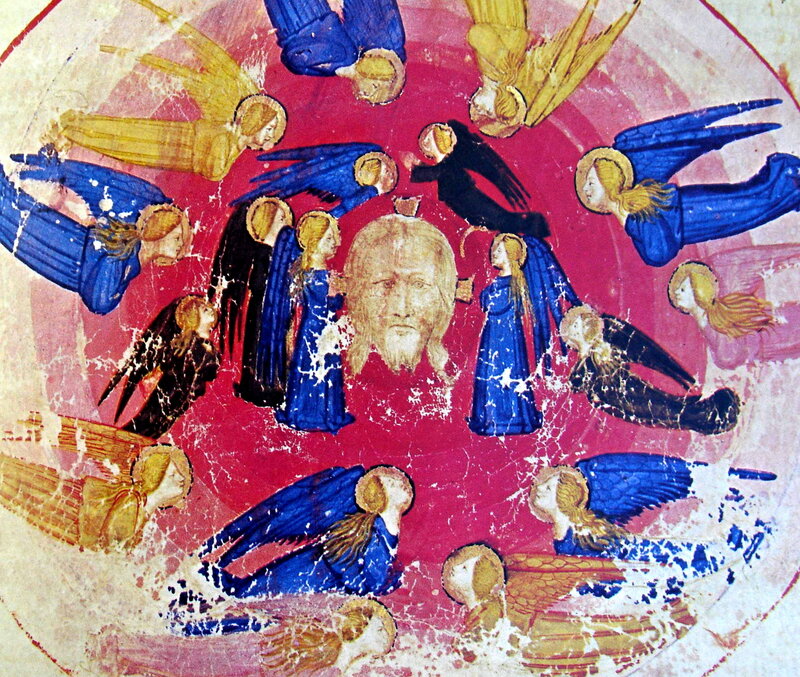 The Mandylion was brought eventually to Constantinople, “the queen of all cities,” on August 16, 944, which is still celebrated as a feast day in the Eastern calendar. 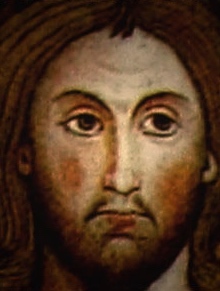 It was recorded as being kept in a golden vessel, and only taken out once a year from the Sacred Chapel, where other precious relics of the Passion were also kept until the sack of Constantinople in 1204. 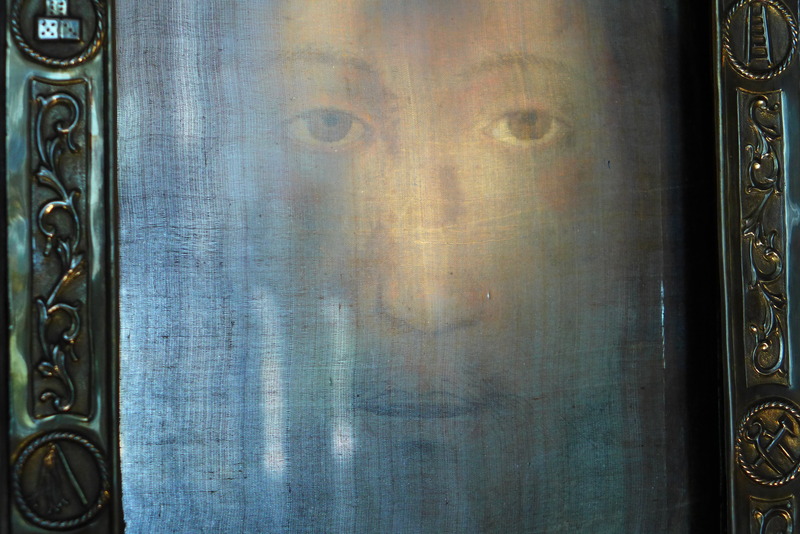 The Veronica–Although historians are still uncertain as to how the veil came to Rome, there is an interesting fresco in the grottoes beneath St. Peter’s Basilica. 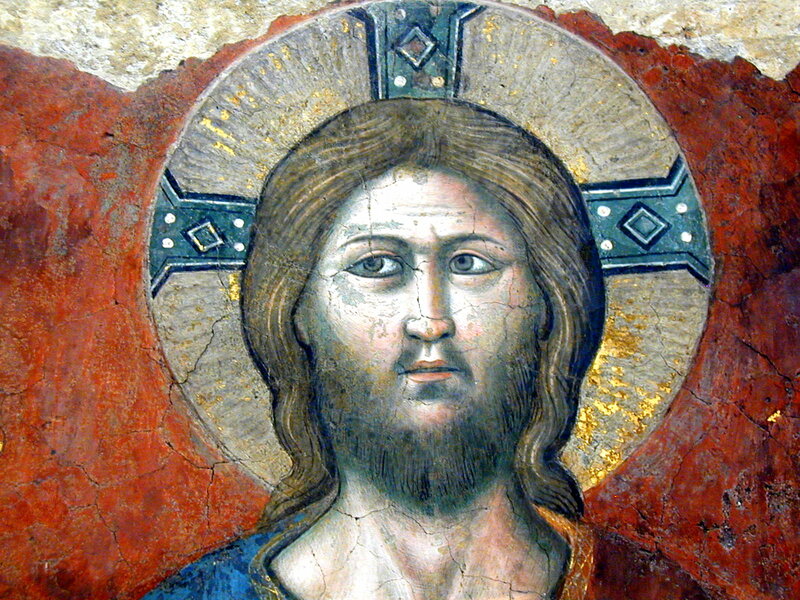 The fresco, commissioned ca. 1608 by Paul V in the area near the tomb of St. Peter, was to preserve the memory of monuments of the old Basilica that had been demolished 12 years earlier. 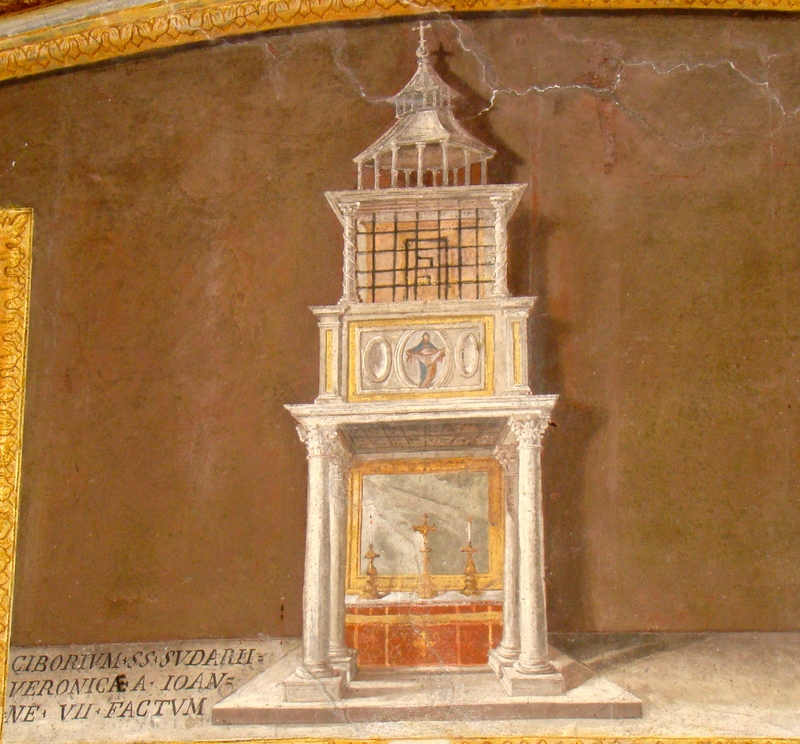 Among the frescoes is the Oratory (dated ca. 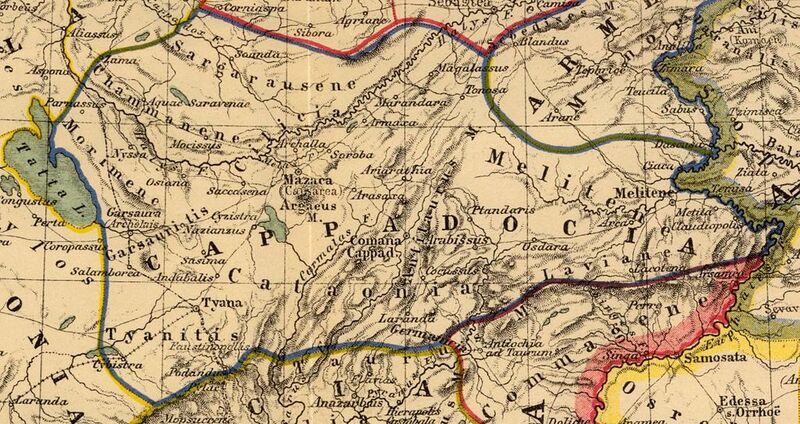 708) of Pope John VII. 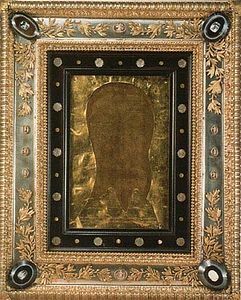 It protected the sacellum or small shrine containing the Holy Veil, which by some accounts, brought by John VII to Rome from Constantinople. 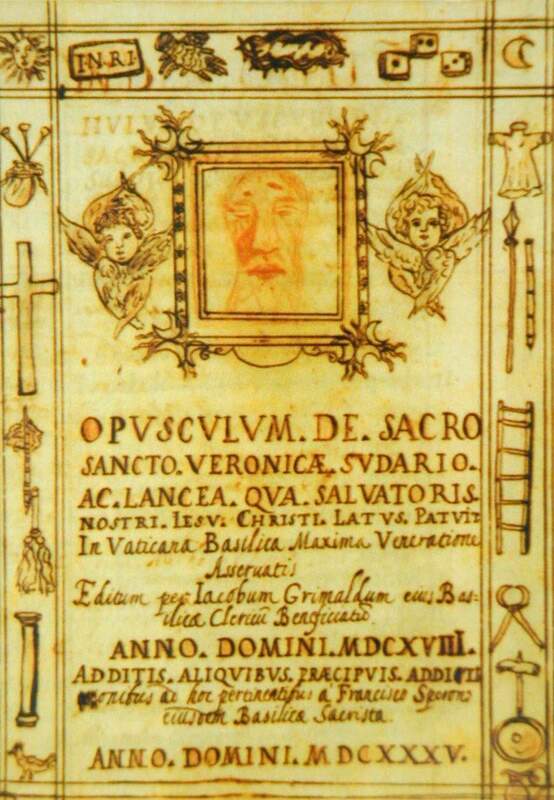 It was Pope Innocent III who brought the Holy Veil out of hiding, by instituting a procession with the Veronica on the Sunday after the Octave of the Epiphany, which was dedicated to the Wedding at Cana. The procession traveled from St. Peter’s Church to Spirito Santo Hospital in Rome. 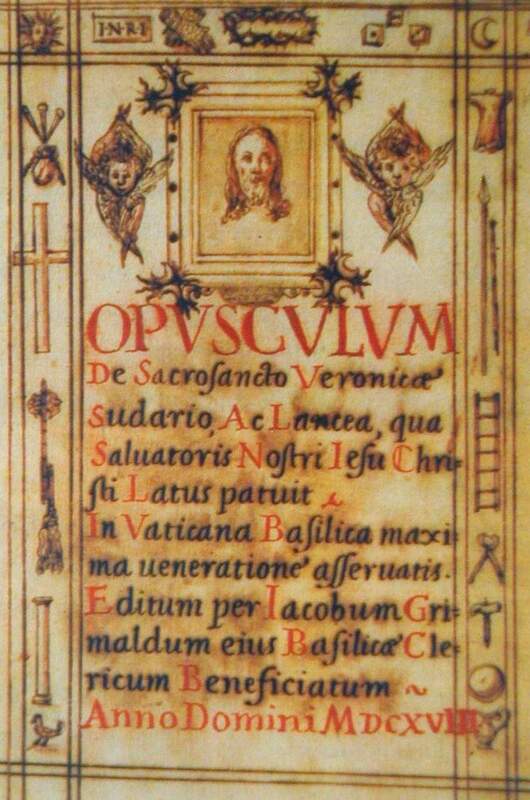 Alms were given along the way (3 denarii) to the poor, which was enough to buy milk, bread, and wine. (This procession was reenacted for the first time in many centuries in Rome on January 17, 2016. Details here.) 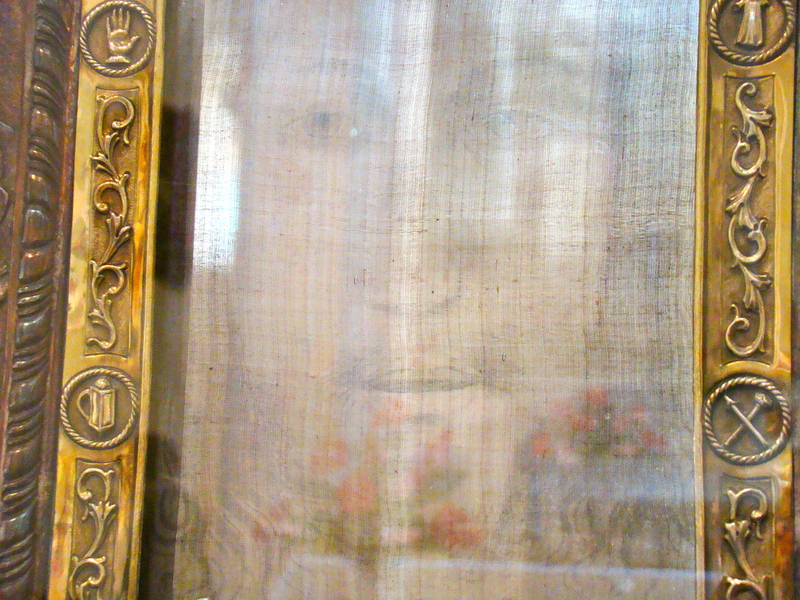 Soon after Innocent III’s procession, the Veronica Veil became the most famous relic in Rome. 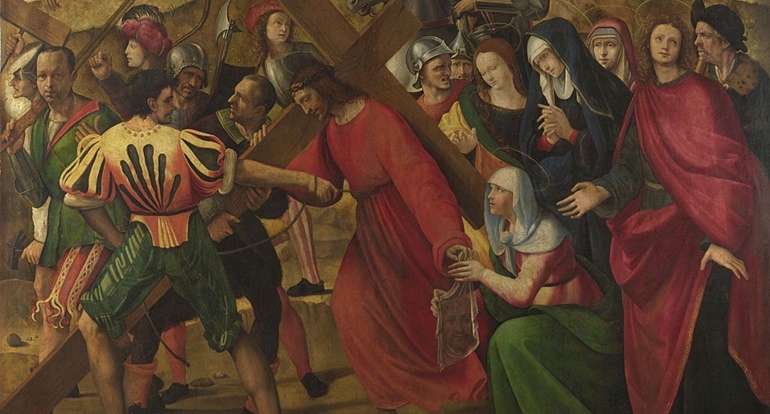 Pilgrims flocked to see the Veronica and artists created many reproductions for the pilgrims. 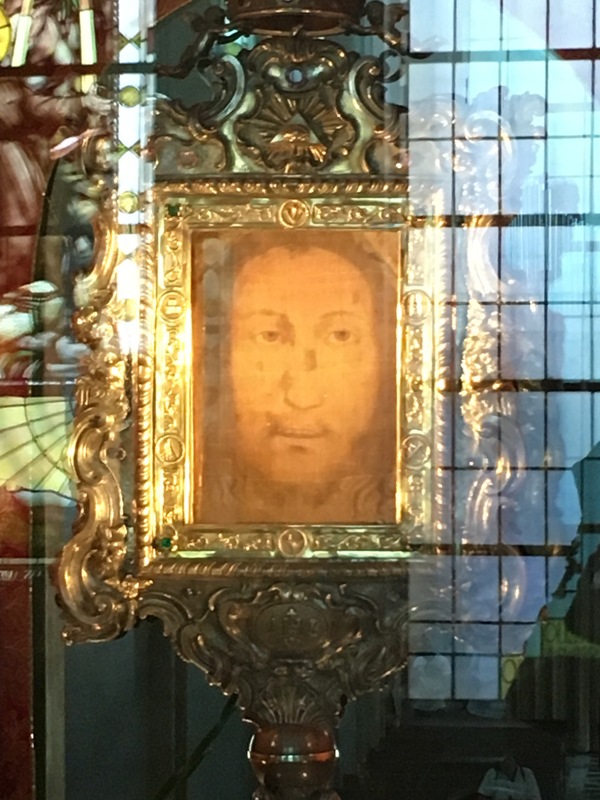 During next four centuries, the ordinary pilgrims included saints and other notable persons who saw the Holy Face for themselves and recorded their experience. 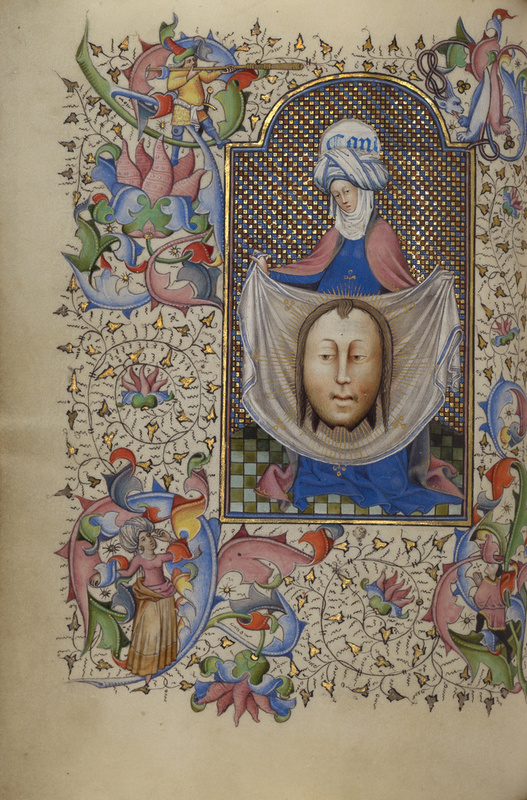 The appearance of the Face on the Veil had mysterious, changeable attributes recorded in art and writing: The veil was described as sheer, almost transparent, and luminous. 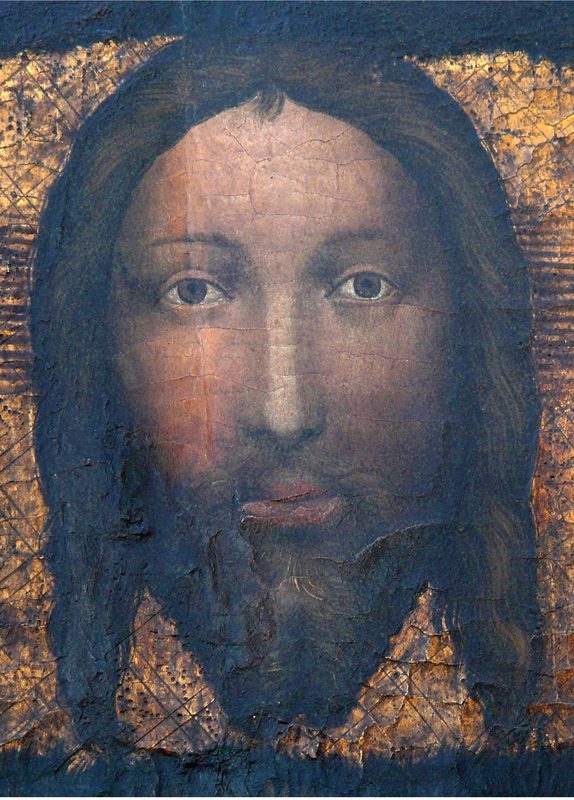 While the face of Jesus was sometimes suffering or serene, in color it was “dark,” “bright,” “bluish,” “black” or “golden”…or even vanished completely. 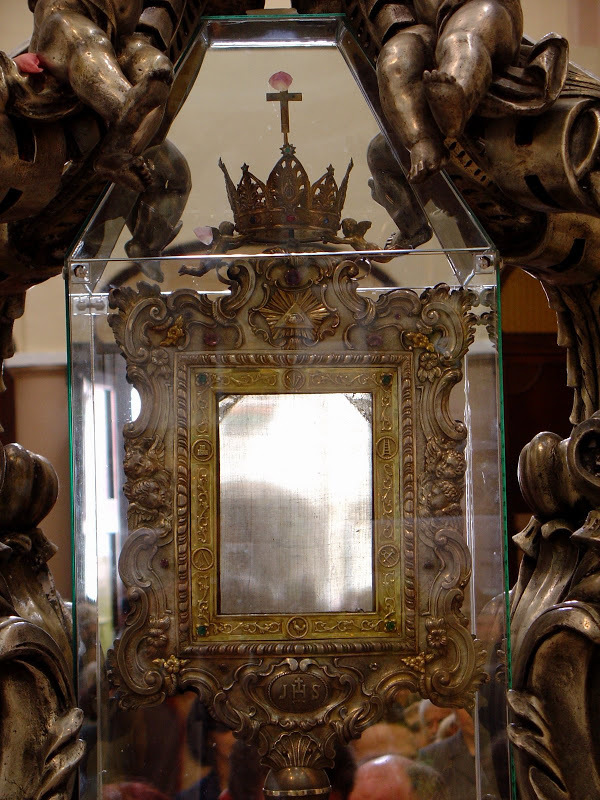 The reliquary frame which formerly held the Veronica Veil on display in the Vatican Museum. 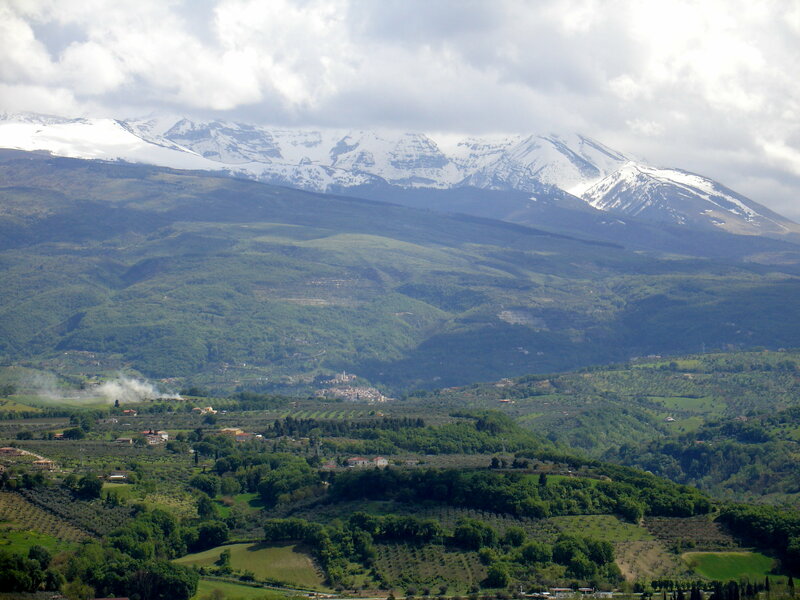 To learn more about the Holy Veil of Manoppello click the Manoppello tab above.